Pre-Purchase Marine Survey - An extensive vessel inspection when considering the purchase of any new or pre-owned boat or yacht regardless of its age, condition or reputation. The survey will reflect the appearance and functionality of the vessel. The survey includes: Hull structural integrity, electrical components and wiring, the drive system, fuel transfer system, engine or other propulsion modules, electronic and navigation equipment, on board support systems, and additional safety equipment. The evidence of previous maintenance, or lack of, is also noted in the survey. An out of water bottom inspection and an operational sea trial should be included and is included with the pricing. Infrared thermal imaging is also included as part of the pre-purchase inspection on certain components of the vessel. This survey is concluded with an overall condition rating and a fair market value of the vessel. • Vessels less than 26 feet are $18.00 per foot LOA*, $300.00 minimum. • Vessels between 26 - 45 feet are $20.00 per foot LOA (includes multi hull vessels). • Vessels more than 45 feet are $22.00 per foot LOA (includes multi hull vessels). Marine Engine Survey - An inspection and evaluation of the vessel's engines so the prospective buyer or boat owner understands the true condition of the engines on board the vessel and what repairs and / or maintenance may be required to get the engines up to good working order. This inspection is very important in determining a more accurate value of the vessel based on the engine's overall condition and performance. Some problems may not be visible or even noticbly apparent during a marine survey until the engine survey is performed. A good thorough marine engine survey can save you a significant amount of money if problems are found before the purchase or a complete failure of the engine(s) occur. I can perform engine surveys on most marine gasoline outboard and inboard engines. I have genuine factory training and hands on repair and service experience with Yamaha, Mercury / MerCruiser, Honda, BRP, and Evinrude / Johnson engines. Some of the tests conducted during a marine engine survey are: A thorough sea trial, computerized marine engine diagnostics, compression testing, infrared thermal imaging, engine oil analysis, CAN bus and NMEA 2000 testing, and engine electrical testing. • Special rates apply for these services based on the manufacturer, year, and model of the engine(s). Please contact us for a quote. Insurance Marine Survey - This survey is performed to assist the insurance carrier in the determination of the risk involved for a particular vessel. Their interests include structural integrity, safety, as well as its intended use. Many insurance companies require a survey on a particular boat or yacht before coverage will be offered. The vessel's fair market and replacement values are included in this survey. • Vessels less than 26 feet are $16.00 per foot LOA*, $300.00 minimum. • Vessels between 26 - 45 feet are $18.00 per foot LOA (includes multi hull vessels). • Vessels more than 45 feet are $20.00 per foot LOA (includes multi hull vessels). Valuation Inspection - This type of inspection is performed in order to obtain adequate data or information solely for the determination of the fair market value of the vessel. This inspection is often required for financial considerations, estate dispositions, charitable donations, or litigation. • Vessels less than 26 feet are $14.00 per foot LOA*, $300.00 minimum. • Vessels between 26 - 45 feet are $16.00 per foot LOA (includes multi hull vessels). • Vessels more than 45 feet are $18.00 per foot LOA (includes multi hull vessels). Damage Inspection - This inspection and investigation is conducted to demonstrate or determine the extent and cause of a reported casualty. The resulting report may be used for claim indemnification or protestation. Normally this inspection is required to assist in the insurance claims settlement process and could include recommended repairs, estimated repair costs, and if requested, possible cause. • $95.00 - $150.00 an hour (depending on assignment, travel expenses may apply, see below**). Video Presentation - This examination is offered to save the prospective buyer the time and expense of visiting the vessel personally. A video of the entire boat will be recorded and converted to a DVD, flash drive or MPEG format and shipped, emailed or posted online as requested. This method can be very useful in determining if further interest in a particular vessel is desired. • $95.00 an hour (travel expenses may apply, see below**). Infrared Thermal Imaging / Scanning - This service is offered to troubleshoot mechanical, electrical or hull problems by finding abnormal temperature anomalies using thermographic cameras. These temperature anomalies that can be detected and photographed can reveal hidden or suspected problems with malfunctioning equipment or hull deformities. Problems infrared scanning can detect are: Overheating wires, malfunctioning electrical equipment, malfunctioning bearings, engine heat sources, transmission heat sources, marine air conditioning malfunctions, leaks in tanks where they can not be typically sighted, and fiberglass delamination. This testing can save a lot of time and money by finding the root causes for problems on board a vessel. This is also a great resource for a prospective buyer to see temperature anomalies within the vessel that may not be seen by using conventional marine survey methods. Findings and thermographic images are then composed into a professional looking report with listed recommendations and are sent to the client. Most pre-purchase marine surveys now come with infrared thermal imaging as part of the marine survey. Special pricing can be arranged if infrared imaging is to be combined with any other marine survey or damage claim inspection. There is also special commercial contractor pricing for this service. Please contact us for those details. A sample pre-purchase marine survey report with thermal imaging can be found here. A sample infrared imaging report from an electrical malfunction on board a yacht can be found here. • $95.00 an hour (travel expenses** and special pricing may apply, see below*****). Oil Sample Analysis - This test includes a spectroscopic examination of the oil to determine the levels of metals, additives, and possibly coolant. The test will also measure viscosity and the percentage of solids in the oil. The test report will include possible causes of any irregularities. Other engine fluid analysis tests for diesel, gasoline, and coolant are also available. Contact us for special pricing of those services. Ultrasonic Thickness Testing - This test is performed by a non destructive ultrasonic audio pulse-echo device that measures the thickness of several different materials that include: Steel, aluminum, poly resin plastics, and various kinds of poly methyl plastics. This test is used to determine corrosion, wear or delamination of a hull where it can not be seen. This test is recommended when purchasing steel or aluminum hull vessels, fiberglass vessels more than ten years old or if corrosion or delamination is suspected. • $8.00 per measurement (or shot). Corrosion Survey - This analysis is performed to see if the vessel's underwater metal fittings are being adequately protected against galvanic corrosion by the existing anodes and bonding protection systems that are currently in place. This analysis will also check for any stray current (also referred to as electrolysis) that may be occurring around the vessel or coming from the vessel itself with the use of a commercial grade corrosion meter. A determination can be made if the vessel's underwater metal fittings and parts are being properly protected, are freely eroding or are being overprotected. All tests associated with this survey are non-obstructive. You can read more about galvanic corrosion here. Carbon Monoxide Air Analysis - This test measures the carbon monoxide (CO) gas in parts per million (ppm) from 0 - 1,000 that may exist in the air inside a compartment or room on board a vessel. The test is performed by a digital electromechanical gas specific sensing device and is used to scan and detect traces of this deadly gas in boats, yachts or commercial vessels. This test is commonly conducted for suspected elevations in CO gas in vessel accommodation spaces and for any suspected leaks in repaired or replaced raw water exhaust or propane gas systems. Marine Engine Diagnostics - This service is a computerized analysis of the engine's built in computer system. A special processor attached to the engine's computer system communicates with engine's ECU and tells the technician valuable information about the engine which includes: The engine's model number, the engine's serial number, actual engine hours, the engine's RPM history profile, the engine's running temperature profile, current and stored fault codes, and a data parameter summary. A report of this analysis can be sent to the Client's email typically within 24 hours after the analysis is completed. Engine Compression Testing - This test measures the amount of compression in each of the engine's cylinders to determine if there is an internal problem that may exist within the engine. Low compression in engines are typically indicators of bad exhaust valves, a bad head gasket, or worn rings on the cylinders. All of which would require an overhaul of the engine. Engine compressions checks are conducted by a qualified marine mechanic and can be conducted on the same day as the survey and can be included in the survey report. • Special rates apply for these services depending on client needs. Please contact us for a quote. Captain Services - We provide captain services with U.S. Coast Guard Licensed Master Captains. We can also provide licensed captains with towing and sailing endorsements. Some of our captains are PADI® Certified SCUBA Divers. Our captain services include: Yacht deliveries, charter captains, boat training, sailboat handling, vessel safety training, captain companions, and crew services. We can provide qualified engineers to be crewed with our captains that are certified gasoline or diesel marine mechanics and certified marine electricians. We provide these services in the United States, Central America, and throughout the Caribbean. • $250.00 - $500.00 a day (depending on the length of cruise and crew needs, see below****). • $95.00 an hour (for any maintenance and/or repair services, see below****). Other Marine Services - These services include: Marine service and repair, pre-commissioning services, yacht construction inspections, yacht maintenance inspections, yacht repairs, yacht repair inspections, return surveys, and open inspection of sails. Travel Expenses - Are not charged within the State of Florida. Other parts of the United States or overseas may or may not include travel expenses based on the availability of one of our affiliate surveyors. Travel beyond the State of Florida is billed at $0.50/mile each way if traveling by vehicle. If traveling by airplane or other means, a deposit may be required to cover the cost of traveling expenses. Some travel may be per a flat travel fee. Travel expenses will be negotiated before the survey or service. Printed Report is Optional - Surveys are typically emailed or mailed via a CD at no charge to the client. Printed survey reports are in a handsome bound report cover, using high definition color printing on high quality presentation paper. $20.00 each to cover printing and shipping costs. Special Construction Boats - Classic boats, boats older than 20 years, yachts over 65 feet in length, commercial vessels, charter boats or wooden boats: Charges may vary relative to the condition of the vessel and/or extra work required. Costs to be agreed upon prior to survey or when on site. All of our vessel surveys and inspections are non intrusive. We leave the vessel the way we found it. * LOA refers to length-overall as listed by BUC® Research, manufacturer or other reference source. **Suenos Azules Marine Surveying and Consulting (aka Suenos Azules LLC) may assess travel charges if the survey is beyond the State of Florida. 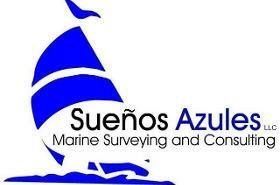 Suenos Azules Marine Surveying and Consulting reserves the right to assess additional hourly rate surcharges if the survey process is slowed by circumstances beyond the control of the surveyor. Some examples would be: A vessel not properly prepared for survey as per instructions, third party contractors not hired by Suenos Azules Marine Surveying and Consulting, vessel equipment located elsewhere, a vessel in poor condition, etc. ***Customers have the option to pay by cash, check, money order or make payments on our website through Paypal or Wepay. All online payments must be verified by Suenos Azules Marine Surveying and Consulting before rendering services. All check and money orders must be made out to "Suenos Azules". Payment is due before or on the day of the survey. Payment in full must be received before the survey report is released. Other payments for certain services may require a fee deposit. Any outstanding amounts are payable within 30 days of the receipt of invoice. Any overpayment will be refunded to the customer either on the day of the survey or within two weeks if by mail. ****Customers needing captain and crew services can pay by cash, Paypal or Wepay only. A deposit and a separate written agreement are required for these specific services. Payments can be made via our website through Paypal or Wepay. All online deposits must be verified by Suenos Azules Marine Surveying and Consulting before rendering services. *****Customers needing infrared / thermal imaging services may be eligible for special pricing if they are combining this service with marine survey or damage inspection services with our company. Our hourly rate pertains to strictly infrared / thermal imaging services only, however hourly pricing may be reduced or waived based on the specific needs of the customer and the service(s) required. Please contact us to detail your specific needs and we will reply with an estimate based on those needs. A deposit and a written agreement are required for these specific services. Payments can be made via our website through Paypal or Wepay. All online deposits must be verified by Suenos Azules Marine Surveying and Consulting before rendering services. If you have any special requests, arrangements or questions please contact us here.